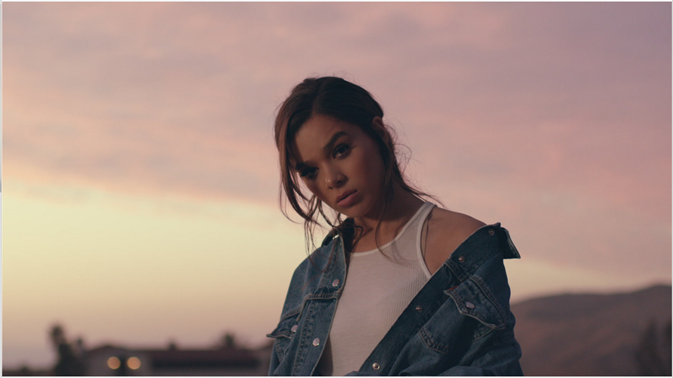 Yesterday, Academy® Award-nominated actress and multi-platinum selling recording artist HAILEE STEINFELD released the highly anticipated music video for her new single with Alesso, “Let Me Go,” featuring Florida Georgia Line & watt. Let Me Go by Florida Georgia Line & watt & Hailee Steinfeld & Alesso on VEVO. Helmed by director Emil Nava [Ed Sheeran, Calvin Harris, Selena Gomez], the cinematic clip captures the heart of the song, showcasing STEINFELD’s incredible storytelling ability, with a countryside performance from Florida Georgia Line and appearances by Alesso and watt. The video’s arrival precedes what promises to be an American Music Awards highlight as they will all perform “Let Me Go” for the very first time at the 2017 ceremony this Sunday. Be sure to tune in at 8/7c on ABC! “Let Me Go” is shaping up to be another big hit from STEINFELD. The song is currently ascending Spotify’s Global Top 200, reaching Top 20 on the chart. Global consumption of the single is rapidly approaching 1 million. At radio, “Let Me Go” has entered the Top 25 at Top 40, where it continues to climb. With its runaway success, STEINFELD'S music has amassed nearly 2.5 billion cumulative streams to date. It’s been a landmark week for STEINFELD. On Sunday, she received “Best Push Artist” at the MTV EMAs. The fan-voted award showcased the groundswell of support she continues to receive worldwide. Next up, she will be honored with Variety’s “Crossover Artist Award” at the inaugural Hitmakers Luncheon this Saturday. It’s just the beginning though. Be on the lookout for more music from HAILEE STEINFELD soon. Republic Records recording artist Hailee Steinfeld has quickly cemented herself as a rising force in pop music with a series of hits under her belt, including her 2015 platinum certified debut single “Love Myself,” double platinum selling smash “Starving” with Grey [feat. Zedd] and recent summer anthem “Most Girls.” Most recently, Steinfeld released her new single “Let Me Go.” Produced by Grammy nominated DJ and producer Alesso and critically acclaimed songwriter and artist watt, “Let Me Go” pairs Steinfeld with one of country music’s best-selling acts Florida Georgia Line. To date, the multi-platinum selling artist has amassed a total of nearly 2.5 billion streams globally. This year, Steinfeld won “Best Push Artist” at the MTV EMAs and Musical.ly’s “Top Covered Artist” award at the 2017 Billboard Music Awards. She also garnered three Teen Choice Award nominations for her work in both film and music. In addition to her thriving music career, Steinfeld is an Academy® Award-nominated and critically acclaimed leading actress. In 2016, she starred in one of the year’s best-reviewed films, The Edge of Seventeen. Her performance earned her two Critics’ Choice Award nominations and a Golden Globe® nomination in the category “Best Performance by an Actress in a Motion Picture – Musical or Comedy.” Steinfeld has wrapped production on her next film, Paramount's “Bumblebee,” the first spin-off in the newly created “Transformers” universe, and will star in the blockbuster “Pitch Perfect 3”, which will be in theaters December 22, 2017.